I really wanted to make something with the apples I picked that was not a pie, because I have a lot of them, and when you have a lot of apples, you need to cook them down to make them go away. I went to Philadelphia to visit my sister on Sunday, and I brought her some apples, plus pel’meni and churchkhela, but I still had a lot left over (say, 17 lbs or so). I found a cookie recipe that sounded fun, but it used apple butter, not plain apples…SO. 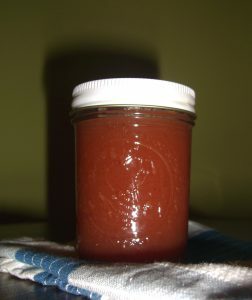 I decided to make some apple butter, and then use what I needed to make cookies and can the rest. I love canning things (see: Meringue Tartlets). 1. Wash the apples and cut them into quarters. Do NOT peel or core them – much of the flavour is in the peel, and much of the pectin (a gelling agent) is in the cores – but do cut out the damaged parts. Put the apples into large pot, add the cider, vinegar and water, cover, bring to a boil, reduce heat to simmer and cook until apples are soft, about 30 minutes. Remove from heat. 2. Press the mixture through a fine-mesh sieve or a foodmill into a large bowl. Return back to the large pot, and stir in the sugar and spices. 3. Bring to a boil, then reduce heat to medium-low, and simmer for about 1 1/2 to 2 hours, until the mixture is very thick, stirring frequently to prevent sticking and burning. 4. Sterilize your canning jars and lids (but not bands) by running them through short wash on the dishwasher (my method) or putting them in a pot of nearly-boiling water for about 10 minutes (my mother’s method). The jars should still be hot when the apple butter is poured in because this will prevent the jars from cracking. Pour in the apple butter, leaving about 1/4″ space at the top. Wipe down the lip of the jar and place the lid and band on. Tighten the band. Place filled and sealed jars in a hot water bath, making sure that they are covered with water. Simmer for 20 minutes to process. Turn off the heat and allow the jars to stand in the water for about 5 minutes to become acclimated to the room temperature, then remove, set upright on a towel (to prevent breakage) and allow to stand undisturbed for 12 to 24 hours to ensure a proper seal.